This worthwhile product is particularly distinguished by highly effective multilamellar liposomes as well as urea, ceramides, hyaluronic acid and vitamin E. The barrier and protective function of the upper layer of the skin is thereby greatly strengthened. Vitamin E protects the skin effectively against environmental influences such as UV-rays. 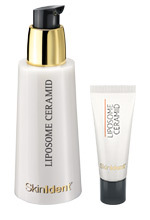 LIPOSOME CERAMID is suitable for all skin types. It is particularly recommended for dry skin with an impaired barrier function in the horny layer. The skin’s barrier function can be damaged by incorrect skincare, environmental influences, the natural ageing process, medication etc.